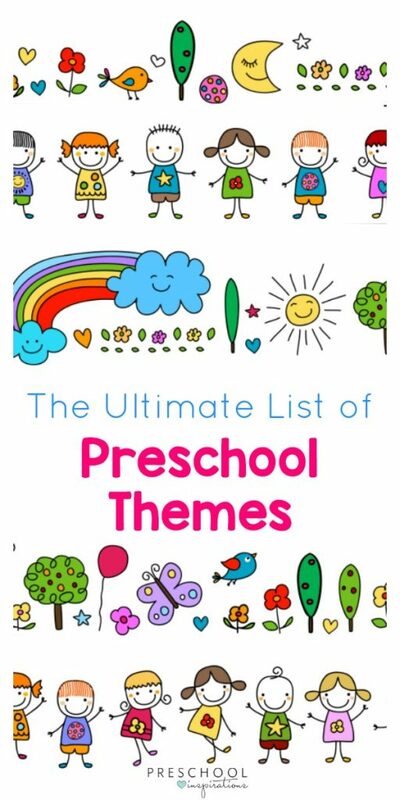 Get the ultimate list of preschool themes to help plan your yearly activities! Preschool themes are one of the best ways to teach children. I’ve used many different types of preschool curriculum throughout my 15 years of teaching, and the one that is my most tried and true is preschool themes. I especially loved to tie them into stories, since that is also one of the most powerful ways that children (and adults) learn. The beauty of using preschool themes for lesson plans, preschool curriculum, and teaching is that they can be used anyone: the veteran teacher, a parent who is homeschooling, and a teacher who is just starting. I’ve adapted my lesson plans to different teaching situations over the years. Toward the beginning, I worked in schools where themes were assigned, and we made a lesson plan for it. This was cut and dry, and I just tried to plan activities that the children were interested in. This is much easier said than done when you are just beginning to teach! As the years went on and as I started working in centers that had more flexibility, I planned themes around books. We would read a best-loved preschool book for a week or two or more, and I pulled out the themes in the book to use with my class. Once I had my own preschool classroom in my home, I modified it even more. We did themes based on the children’s interests, and I brought in books to support their learning along the way. The preschool themes list is just a start! I’ve added some of my favorite activities with many of the themes, and I have included some of the lesson plans that I made with some other awesome early childhood educators and homeschool mamas for a preschool curriculum that we have available for purchase. I’ve made a free printable preschool theme list you can grab here. Or you can get all of my free resources and printables by joining my VIP Subscriber Library! 100th Day of School Theme – Get those creative juices flowing by celebrating the 100th day of the school year, which typically falls in January. Outfits, decorations, small themed snacks…the possibilities are endless! Bonus points for being a fun way to get kids counting. African Theme – Africa has so much to learn from. There is a wealth to be learned about the food, people, and animals, and those are just a starting point! Need a lesson plan for it? We love this African themed lesson plan! 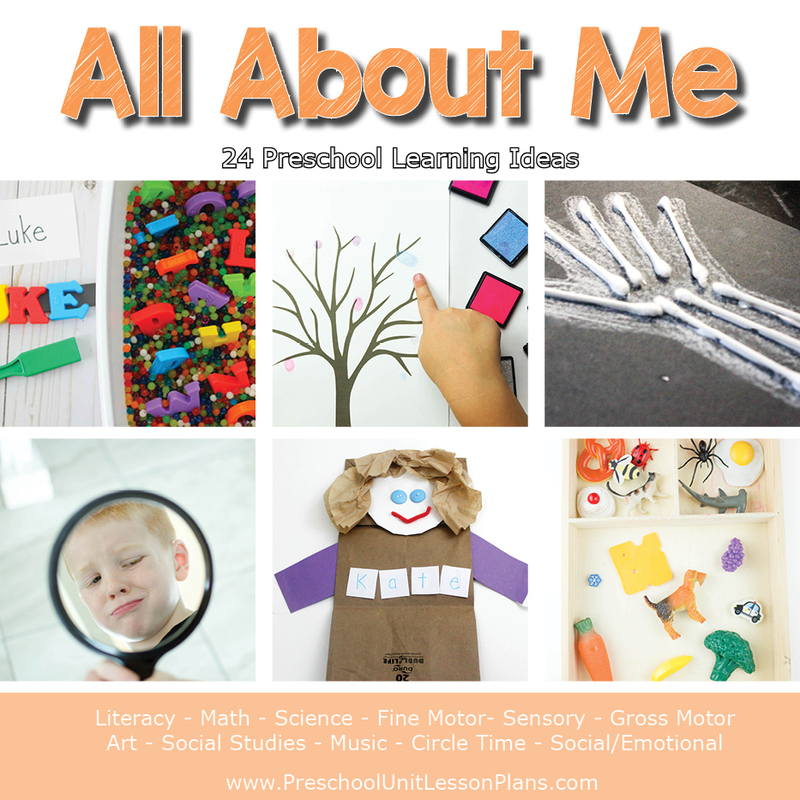 All About Me Theme – Children, much like adults, love to talk about themselves! Children can learn about their own features and attributes, as well as their community. This is an easy place to incorporate name recognition and activities, such as tactile name writing practice or this simple craft. Or you can grab the All About Me Theme in our store for lots more ideas! Alphabet Theme – A perfect reason to read Chicka, Chicka, Boom, Boom, sing alphabet songs, and to do activities like practicing the letters of their name. Don’t forget about alphabet posters too! This Chicka, Chicka, Boom, Boom lesson plan looks too fun! America Theme – Both North and South America provide a ton of source material, with their cultures, weather, holidays, animals, and more. Anna Dewdney Book Study Theme – You’ve surely run across the beloved Llama Llama books. Bring them into the classroom with this beloved author (she is one of my favorites)! There are a ton of social/emotional skills to be discussed and practiced in Llama, Llama, Red Pajama and Llama, Llama Misses Mama. But let’s be honest, they’re all a treasure trove of social/emotional skills. Animal Theme – The world is your oyster here (possibly literally!) So much to choose from: mimic animal movements, learn about habitats, read some of the million books starring animals, talk about different sizes, listen to rare animal sounds, or make a craft! You can start with your class’s favorite animal and go from there. Grab our animal lesson plan here. Apple Theme – From taste testing, to art, and apple books, or apple picking. There’s so much to do with apples! 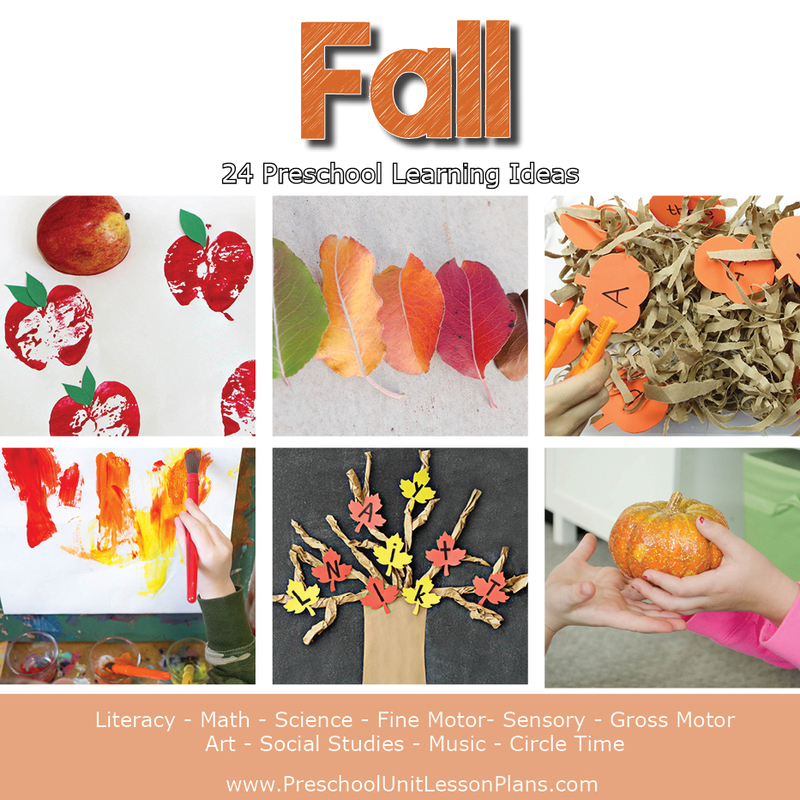 This theme can easily be used in the fall, with tons of related preschool apple activities. Our friends at Preschool Teacher 101 have an entire apple theme lesson plan in their store. Arachnid Theme – Study spiders, scorpions, and other eight-legged creatures and how they are different from bugs. Play this fun game using pictures of real spiders, and of course don’t forget to read The Very Busy Spider! Arctic/Antarctica Theme – Bundle up to learn about the extreme places of the world, and the animals that live there (as well as the ones that don’t). This theme is a fun time to use games and activities with ice. Or find a plethora of ideas in this Arctic lesson plan or over at Planning Playtime. Asia Theme – A wonderful place with tons of history and rich traditions! Use this preschool theme to explore cultures, food, festivals, and more. Australia Theme – Wallabies, kangaroos, and koalas — oh my! Here’s another continent that has tons of unique animals and fun foods like Vegemite. See the Kangaroo theme for my favorite book for Australia. Need some more ideas? Take a peek at this Australia lesson plan. Balls — One of my favorite lesson plans for working on movement and gross motor! Younger children need this, and it’s wonderful for older kids too. One of our favorite activities is putting butcher paper on a slide and rolling paint covered balls down. Just be sure to have something to catch it at the bottom. Or get an entire ball lesson plan to get more ideas. Back to School Theme – A perfect time to go over class rules, routines, the schedule, and to see what the classroom offers. It’s also a great time to show off your centers and introduce an age-appropriate visual calendar! Or get all the ideas you need in this back to school lesson plan. Beach Theme – If you’re lucky enough to live in a coastal area, this is a perfect opportunity for a field trip! Otherwise, you can make a sensory play recipe that feels just like beach sand. Talk about the unique creatures and the different textures. Also a great time for an ocean creature discovery bottle! Or get a whole beach lesson plan to make your theme a splash! Bear Theme – Watch out! It’s a — bbbbbbear. This preschool theme is a sure win! These animals live all around the world, so you can use it to incorporate everything from geography to colors. There are a ton of bear-related books, including the wonderful Brown Bear, Brown Bear, What Do You See? and themed activities to go along. And of course, no bear theme would be complete without going on a bear hunt! Our friends at Preschool Teacher 101 have a super fun bear themed lesson plan in their store if you’re in need of more great ideas! Bee Theme – One of the hardest workers on the planet who helps take care of some of our most important plants and flowers. This torn paper flower craft is an easy tie-in as you talk about these busy helpers. Birds Theme – A perfect study for the birds in your area and chances you are that you might be able to see some of their nests if you do it at the right time of year. Or call them right to your yard with a classic pine cone bird feeder. The amazing teachers at Preschool Teacher 101 even have a bird lesson plan in their store. Bubbles Theme – Blow them, paint with them, put them in the sensory table, and more. Every preschooler loves bubbles! Make a kitchen sink bubble explosion for a themed sensory science experiment. Get an entire bubbles lesson plan from Preschool Teacher 101. Bugs and Insects Theme – Bugs and insects are different, and it’s fascinating to find out what those differences are. This is one of the most popular preschool theme studies because children are fascinated with and love to explore and observe bugs. And of course, don’t forget about the butterflies! 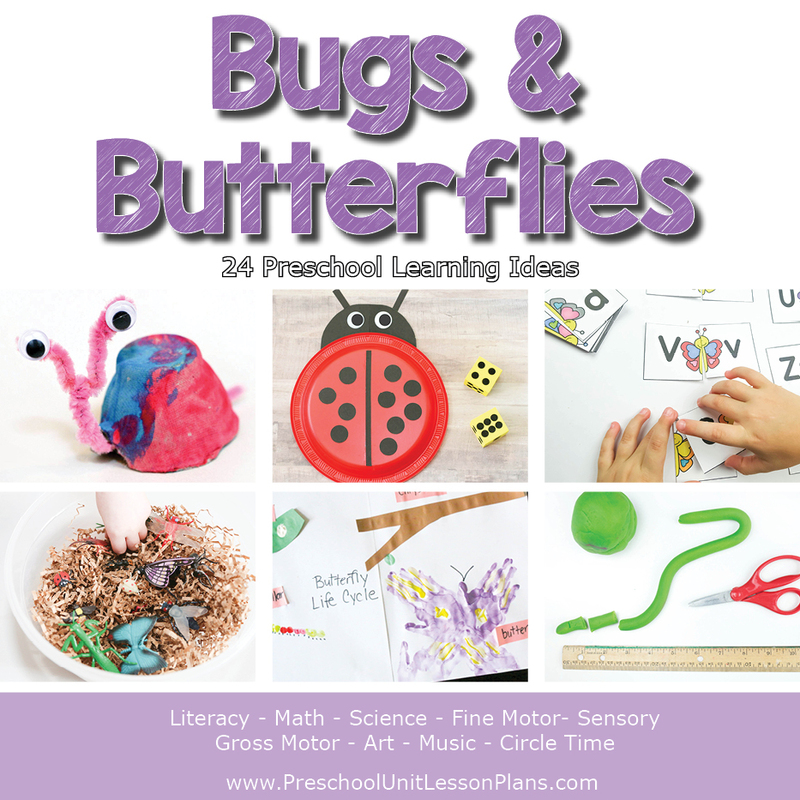 See our bugs and butterflies unit lesson plan for even more ideas! Camping Theme – Set up a tent or make s’mores. This is a great reason to pull out the flashlights and to talk about spending the night in nature. Turn your dramatic play area in a campground. Or get lots more ideas with these camping lesson plans. Chinese New Year Theme – The Chinese New Year, one of the world’s most celebrated festivals, happens each year between January 21st and February 20th. This is a special time for families to gather together and honor deities and ancestors, as well as lots of other fun cultural customs. Need some more ideas? Try these Chinese New Year activities. Christmas Theme – Make lesson plans based on your program’s philosophy. I’ve done Christmas as a faith-based preschool theme as well as one that incorporated jingle bells, Christmas tree crafts, and an advent calendar countdown. Or get some great ideas with this Christmas lesson plan. Christmas Around the World Theme – Learn about Christmas, Hanukkah, Kwanza, and other cultural holidays around the Christmas season. There are lots of different foods and traditions to discover! Colors Theme – Identify colors, learn about primary and secondary, and use this color sensory bottle to find out what happens when they mix! This is a perfect time to mix up a color changing volcano, too! 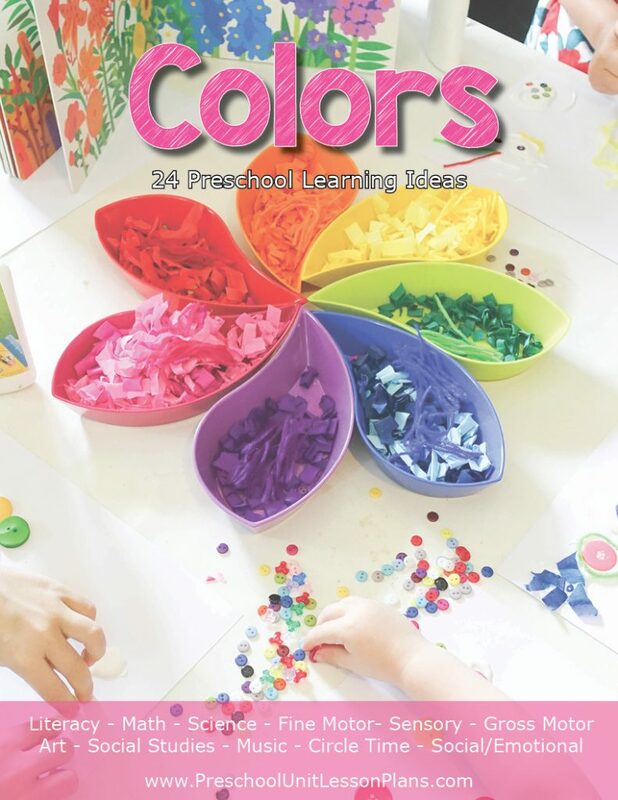 See our color lesson plans for even more ideas! Or take a peek at the ideas on Planning Playtime. 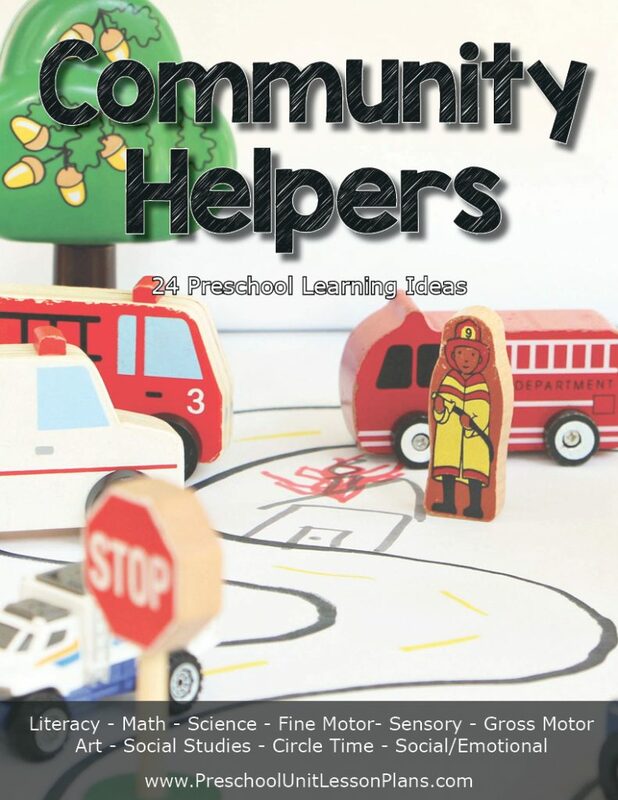 Community Helpers Theme – A tried and true preschool theme. Learn about doctors, firefighters, garbage collectors, police officers, community managers, and more. I love this resource for ideas for community helper centers and activities. We also have an entire community helper lesson plan in the store. 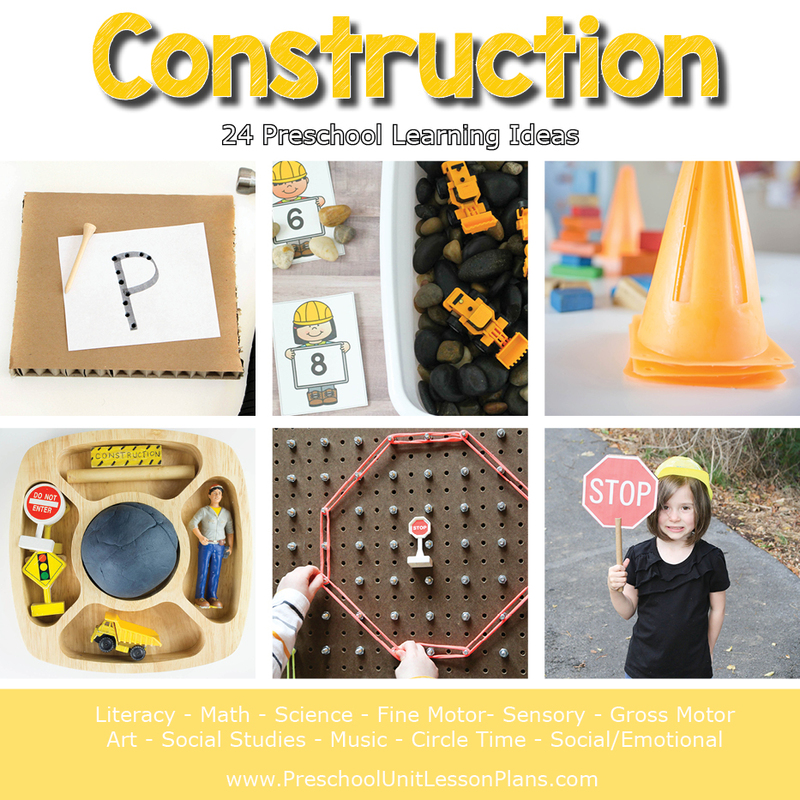 Construction Theme – Children love seeing and talking about bulldozers, dump trucks, cranes, and dig sites. Turn this into a small world sensory bin and more. We have lots more ideas in our construction theme lesson plans. Cooking Theme – Make bread in a bag, homemade ice cream, a snack for tea time, or anything else that gets kids excited about the kitchen. We love all of the great hands-on activities over at Planning Playtime. Dental Health Theme – Dental Health month is in February, and this is a great month to talk about cleaning teeth and what kinds of foods are good for them. Here are some great dental health activities. Or grab an entire hands-on dental health lesson plan. Desert Theme – Desert life is hot and full of unique creatures such the desert tortoise and plants like the prickly cactus. If you live near this climate, pick your favorite flower and turn it into a beautiful discovery bottle. Desert animals are also unique and fun to study. 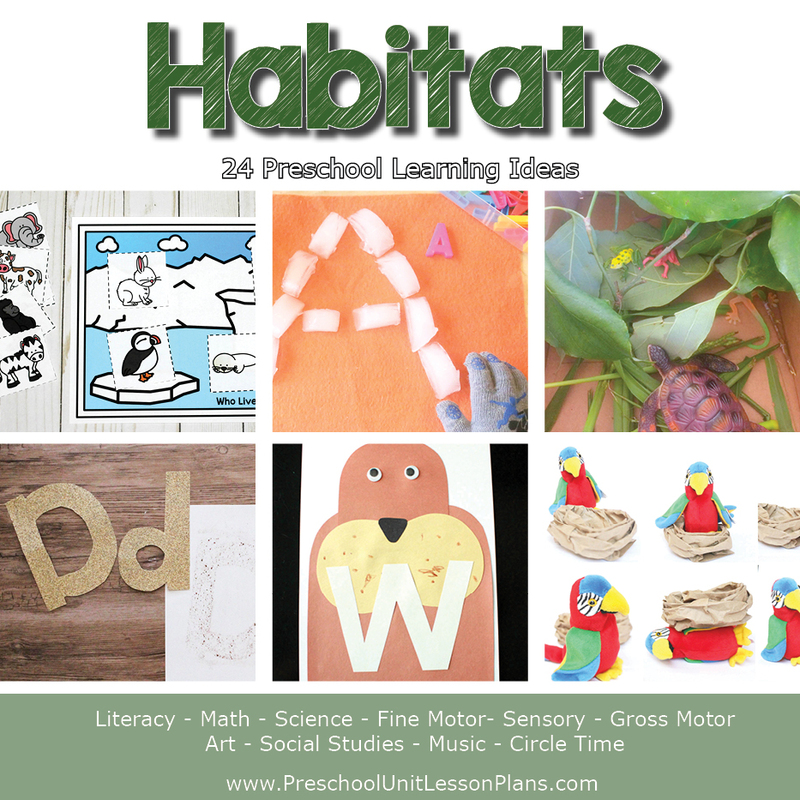 Expand this preschool unit, and it can be a habitat theme. 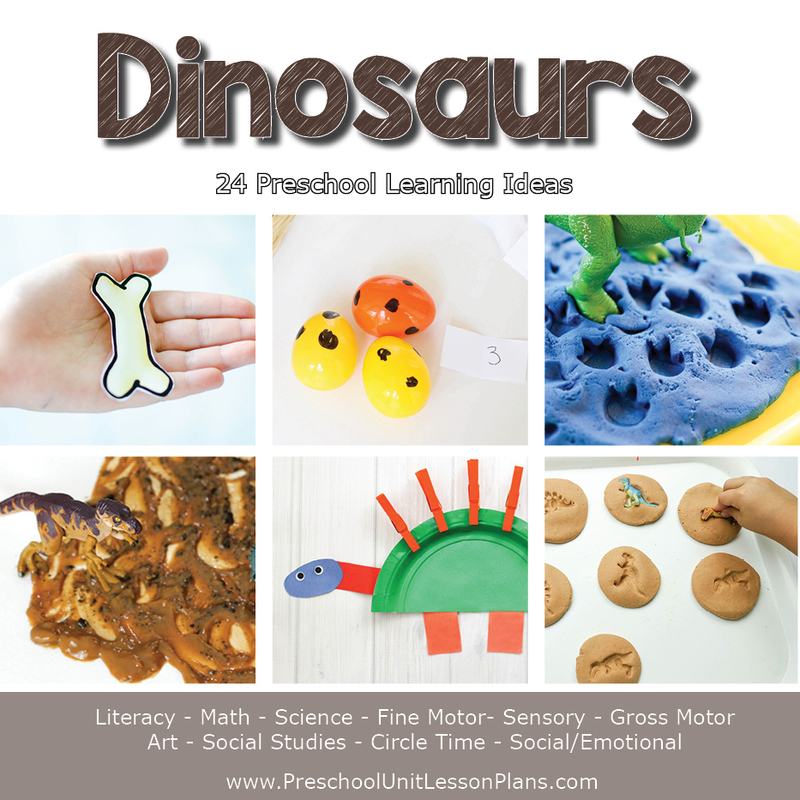 Dinosaurs Theme – A beloved preschool theme that kids naturally adore learning about. Have a DinoNovember, or any other month of the year or play some dinosaur games. Get an entire dinosaur themed lesson plan in our store. Dr. Seuss Theme – March 2nd is Dr. Seuss’ birthday and the perfect time to read through some of your favorite Dr. Seuss books. One that my preschool class always loves is One Fish, Two Fish, Red Fish, Blue Fish. Easter Theme – This preschool theme has so many options. It can be celebrated as a faith-based theme celebrating the resurrection of Jesus Christ, or as a non-religious holiday. Either way, it’s a great way to implement traditions such as egg dyeing, Easter egg hunts, Easter art activities and crafts, and more. See some fun Easter games. Or grab an entire Easter lesson plan from the Preschool Teacher 101 store. Earth Day Theme – Earth day is a way to incorporate learning about nature, recycling, and taking care of our world into your lesson plan. Include some sensory play with this earth day slime. I also love throwing in the book The Lorax during this time too. If you need an Earth Day lesson plan, the amazing teachers at Preschool Teacher 101 have you covered! Emotions and Feelings Theme – This preschool theme is great for social/emotional development and can be done any time of the year. Don’t miss the chance to use calming glitter jars and other sensory tools while using this theme! There are lots of ideas in this emotions themed lesson plan unit. Eric Carle Theme – A book study preschool theme is always one of my favorites. Just grab your favorite Eric Carle books, and you’ll have amazing content for weeks. 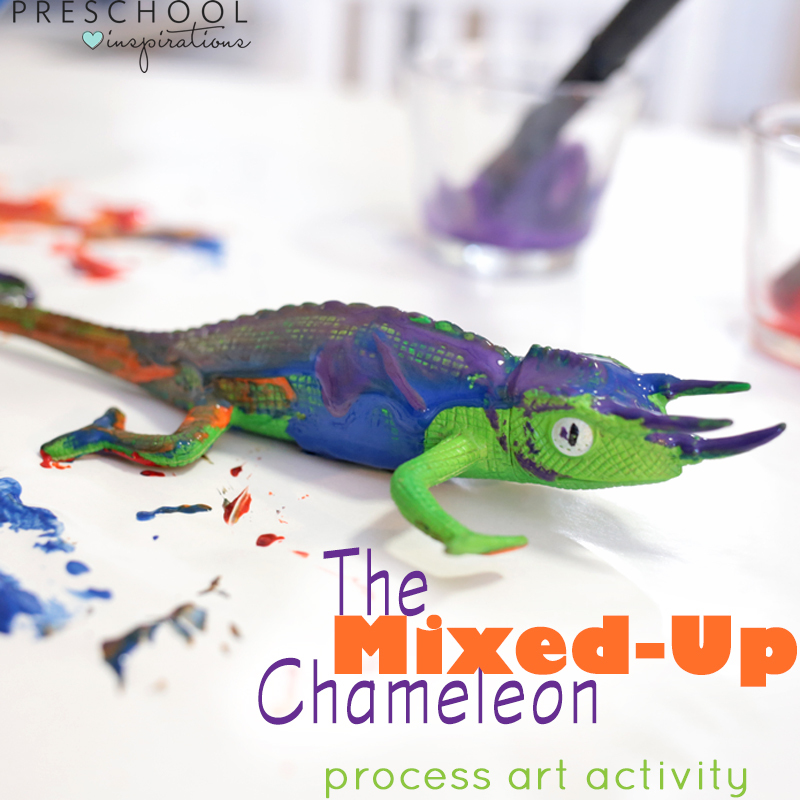 An easy win is to pair The Mixed-Up Chameleon with this process art activity for a great preschool story unit. Europe Theme – Castles, history, traditions, languages, cultures, and holidays…Europe has it all! It’s also home to some great play-based learning philosophies, like how they run preschools in Sweden. Fall Theme – Whenever the season changes, I use that as my perfect opportunity to make it my preschool theme for that lesson plan. Fall is a perfect overview of what the kids will be experiencing soon with the cooler weather. Fall books, art activities, crafts, and simple themed activities can be found in abundance! Get an entire fall lesson plan in our store. Family Theme – Family is a perfect preschool theme that can tie into All About Me or Thanksgiving. It is also a great way to help build community and to get to know more about your students. Get an entire family lesson plan theme from some of our favorite teachers! Fantasy and Fairy Tales Theme – This theme is one of my favorites that I did either as a Halloween alternative or after Halloween. After kids go trick or treating, they want to talk about it and keep doing it, so I just went with it. Cue the dramatic play! We bring in all of their costumes they want to share and keep going with their interests. See this fairy tale lesson plan to make your theme even more magical! Farm Theme – One of the most beloved preschool themes! Farms are great for sensory activities and learning about animals. You can even use the animals as a gateway to math! 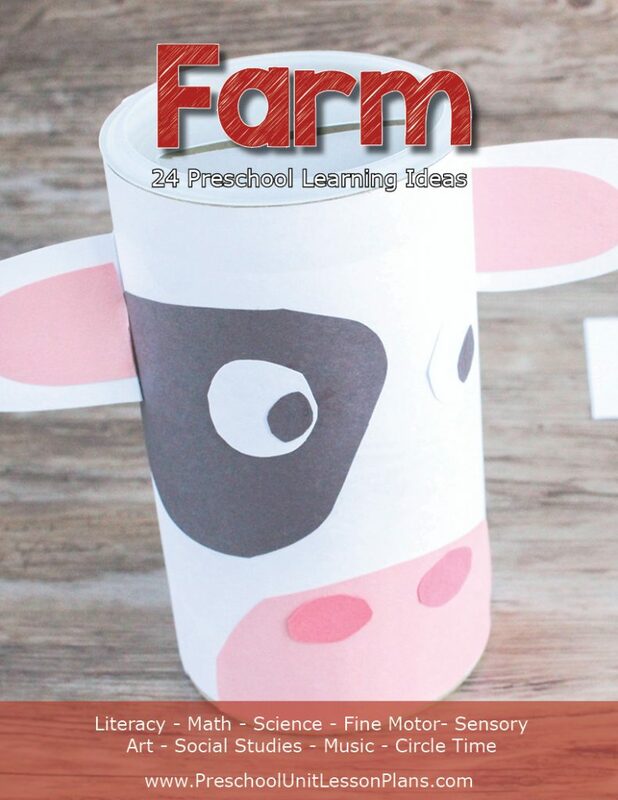 Grab an entire farm themed lesson plan in our store. Fine Motor Theme – Preschoolers need strong muscles to help them learn to write, and what better way to do it than with a fine motor lesson plan! One idea that always keeps my classes engaged is to utilize your sensory table for some open-ended fine motor practice. Fire Safety Theme – A great preschool theme to do in October! Lots of practical ways to teach children how to prevent fires, as well as what to do if one occurs. Plus, I always loved doing a trip to the fire station! This could also be part of a community helpers theme! Fish Theme – Fish are found in rivers, lakes, ponds, and oceans and can be used as part of an ocean theme, pond life theme, or all on their own. Try this fun rainbow fish art project and pair it with one of my all-time favorite books, The Rainbow Fish. Grab a whole sea of ideas with these fish lesson plans. 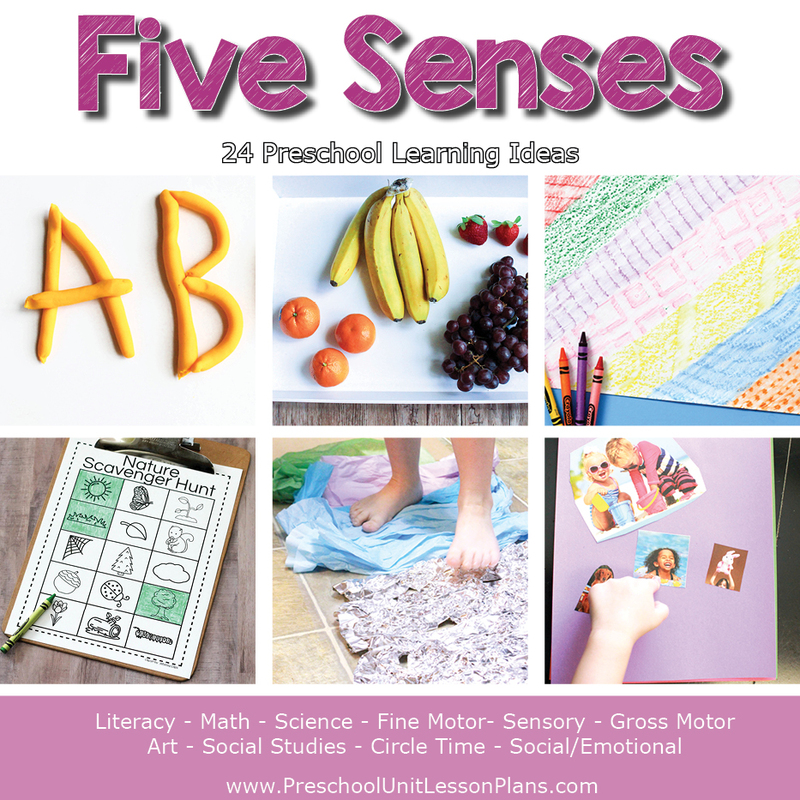 Five Senses Theme – The five senses are so important to our daily living and a great preschool theme. Learn about taste, touch, smell, hearing, and feeling. We have an entire five senses lesson plan in our store or see the five senses activities from Planning Playtime. Flowers Theme – Learn about popular flowers or local flowers during a spring preschool theme. Lots of fun flower crafts to create here! This one is also easy to tie into another preschool theme, like spring or bees. 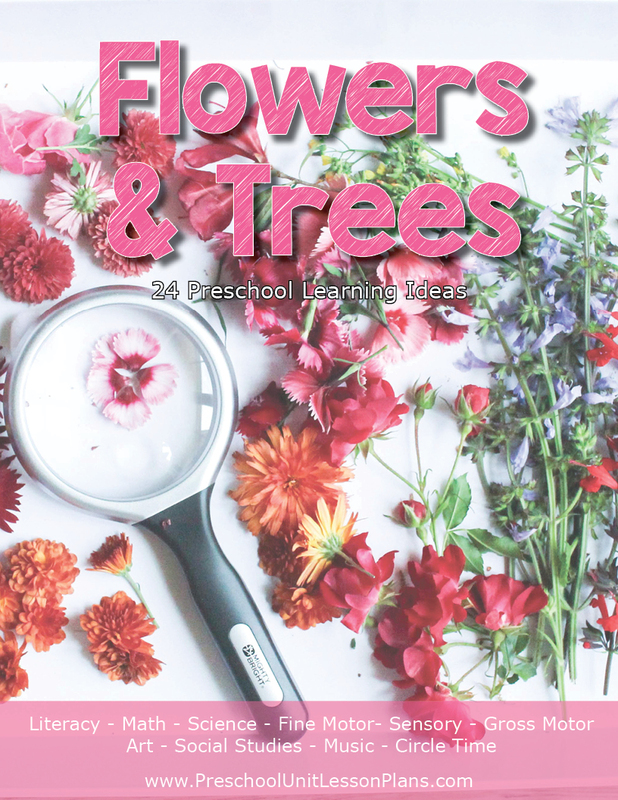 Or you can head to our store and grab an entire flower themed lesson plan. Friendship Theme – This theme is one that I love doing around Valentine’s day. Help children navigate through the important foundations of friendship and learn to be a better friend themselves. Sending friendship letters is a great tie-in to this theme, as well as a wonderful way to practice writing and name recognition. Snag an entire friendship theme lesson plan to get even more great ideas. Fruits and Vegetables Theme – Want a preschool theme that’s more than just apples? Talk about all the fruits and vegetables! What makes them different, how to grow them, how they taste, and why they are good for us. Here is a vegetable theme lesson plan from our friends at Preschool Teacher 101. Galaxy Theme – Need a space theme? This a great one to learn about the solar system, the stars, the moon, or any other favorite part about space. Make a galaxy calm down bottle to engage the senses! Garden Theme – Get children excited about gardening, planting, life cycles, fruits and vegetables, and what plants need to grow with a preschool garden theme. The incredibly talented teachers at Preschool Teacher 101 even created this wonderful garden theme lesson plan. Geography Theme – Learn about the different countries and continents of the world in a geography preschool unit. We especially love using map puzzles to do this. This Around the World lesson plan theme in our store would be perfect for a geography theme! Gingerbread Theme – Each year in November I love to read some of our favorite gingerbread books, The Gingerbread Baby and The Gingerbread Man, and we turn this entire study into a theme. This is a great time to make some gingerbread slime! If you need an entire gingerbread lesson plan, we highly recommend this one from Planning Playtime or this one from Preschool Teacher 101. They even have an entire winter theme bundle. Gross Motor Theme – A gross motor preschool theme or unit is perfect for those weeks when you need ways for kids to get moving. Whether it is too hot or too cold to go outside, or even if it’s field day (or week), plan a unit on getting children to move those large muscles. Habitats Theme – Take your animal studies farther by teaching children which animals live where and possibly even why. Kids will love learning fun facts about animals and their homes! If you need more ideas for a habitats unit, we a habitats lesson plan available in our store. Halloween Theme – Halloween can be spooky but it can also be sweet and fun. Holiday preschool themes are perfect for having a special week while still learning! Check out this cute ghost sensory smash for a sweet activity that’s sure to be a crowd-pleaser. There are some super fun Halloween activities at Planning Playtime. And our friends at Preschool Teacher 101 have this great Halloween lesson plan or this entire Halloween Bundle lesson plan. Hibernation Theme– Help children learn even more about animals by teaching which animals hibernate and why. Maybe bring in some special cozy blankets and make nap time extra fun. Hot and Cold Theme – This is a great science theme for your lesson plans. Talk about the weather outside or the changing seasons, and of course what it means to touch a hot stove or cold ice. I love using differently-shaped ice cube trays and molds, so I always incorporate playing with ice as part of this preschool theme! Need some more weather ideas? 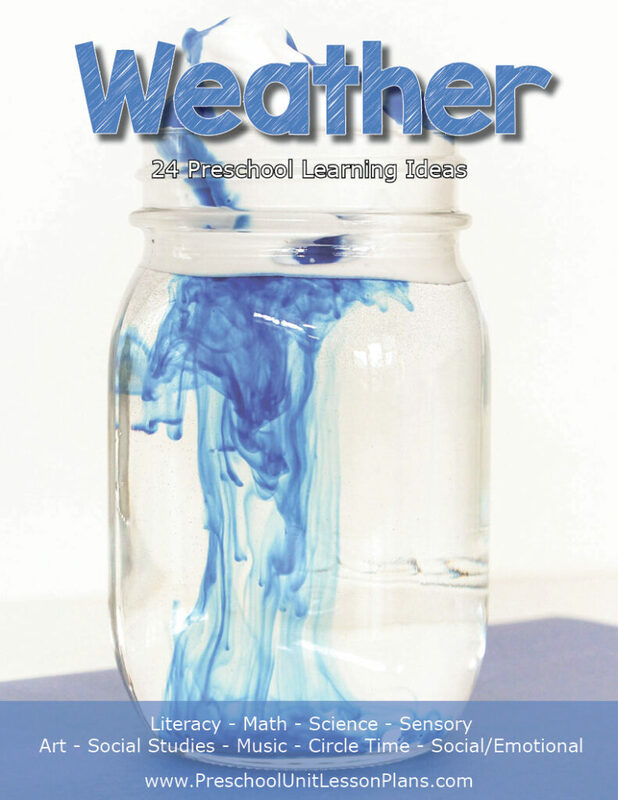 Check out this weather lesson plan. Ice Cream Theme – Most kids love ice cream as a yummy treat, so using it as a preschool theme is a fantastically sweet idea! Have you tried this 3-ingredient ice cream scented bubble recipe? We especially love this ice cream writing tray! Eat up some more delicious ideas in these ice cream activities or this ice cream themed lesson plan. Jungle Animals Theme – The jungle is a fun place to visit or imagine visiting. Between the trees and animals, there is plenty of ways to have learning fun! Did you know you can even make jungle slime? Kindness Theme – Kindness is such an important value to teach children. The earlier they learn, hopefully the easier it will be for them to spread kindness throughout their life. Some songs, like Hello, Friend by Dr. Jean and other hello songs are great ways to promote kindness toward other students. We also love to teach kindness with the Kindness Elves. Kangaroos Theme – Kangaroos are a fun animal to study because they carry their babies in a pouch and hop farther than many animals. Just think of the fun kids will have with mamas and their joeys! We love the book, Marsupial Sue, to go along with it! Ladybugs Theme – Ladybugs are loved by so many. They are sweet little bugs that are not only perfect for Valentine’s Day but a fun part of a bug unit. Leaves Theme – Leaves make a great preschool theme for many times of the year. During the fall months, colored leaves are absolutely magical. During the spring months, leaves can teach about life cycles and new growth. Check out the many leaf science experiments your class can do! 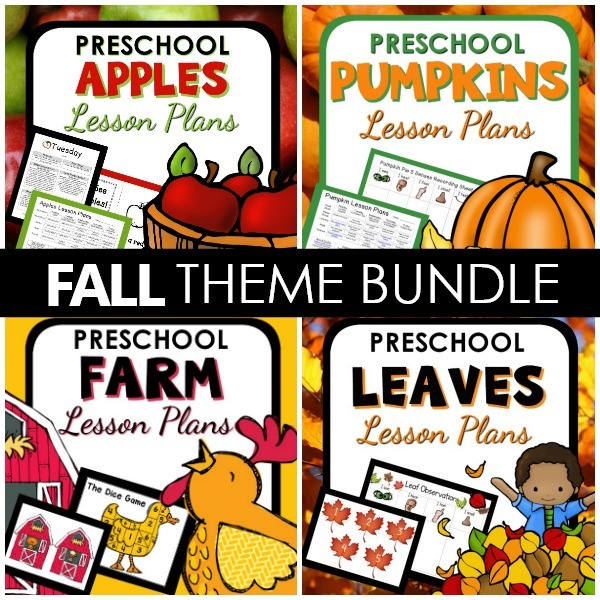 Preschool Teacher 101 has a leaves lesson plan and even an entire fall theme bundle. Magnets Theme – Magnets are such an exciting tool for teaching science. Magnets can also be a fantastic tool for practicing counting, learning the alphabet, making a discovery bottle dance, and more! Mindfulness Theme – Help children learn to be more calm, intentional, and understanding. This is a perfect theme for introducing yoga, whether through books or kid yoga videos. It’s also perfect to use brain breaks and can even be used for outdoors. Monsters Theme– This is a perfect fit around Halloween, or even when children start talking about their fears. This preschool theme doesn’t need to be a scary one – check out these not-so-scary monster books for kids! 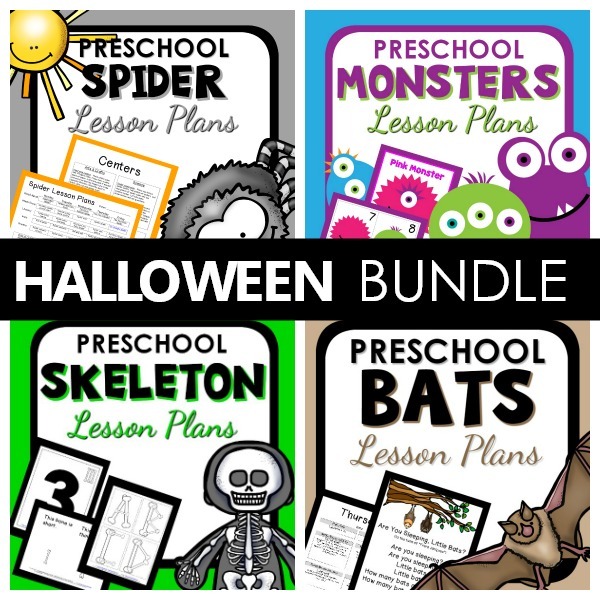 Or grab an entire Monster lesson plan in the Preschool Teacher 101 store. Moon Theme – Whether you are studying about space or just the moon, this is always a fun theme with so many ways to supplement it. This moon phases activity with Oreos looks delicious! Music Theme – Music is one of the best ways to teach children. In fact, it’s been proven that music actually makes children smarter! Paint to music, dance to new songs, and learn about different musicians and composers. Music can be used anytime during the day: to say hello or goodbye, during circle time, to transition from one activity to another, and to introduce or reinforce new concepts. Check out this handy ultimate guide to preschool songs list! Nature Theme – One of the easiest preschool themes is a nature theme. It’s an amazing way to get children to connect with the world around them, as well as to use materials that they can use and incorporate on a daily basis. Spending time outside is SO good for children – read about the benefits of Forest School! Nocturnal Animals Theme – Bats, owls, hedgehogs, cats, and other animals are nocturnal. This is a fun preschool theme that allows you to explore and learn more about these fascinating creatures. New Years Theme – Talk about old and new, incorporate calendar and time concepts, make New Years slime, or have a Noon Years Eve party. The possibilities are endless! We, of course, always include copious amounts of glitter in our New Year’s celebrations, like in these calming glitter jars. Numbers Theme – Get children counting and learning the foundational math skills with a preschool number theme. There are so many ways to make this fun, like with a number recognition activity. This can also be a great time to teach children their phone number. Nursery Rhymes Theme – Nursery Rhymes are a classic and fun way to encourage reading as well as other learning elements. This applies for new stories or stories that kids already know and love. Take it one step further with this nursery rhyme sorting activity! Nutrition Theme – Nutrition is an important part of life that kids need to understand and learn at a young age. Fortunately, we can make nutrition fun! Talk about healthy foods while taste testing them as well as important habits such as brushing teeth. Ocean Theme – A perfect way to fill your preschool curriculum with ocean creatures, sensory play, shells, sea stars, and more. Have you seen the book Commotion in the Ocean? You can also tie this into your moon theme by discussing tides, currents, and other ocean phenomena. 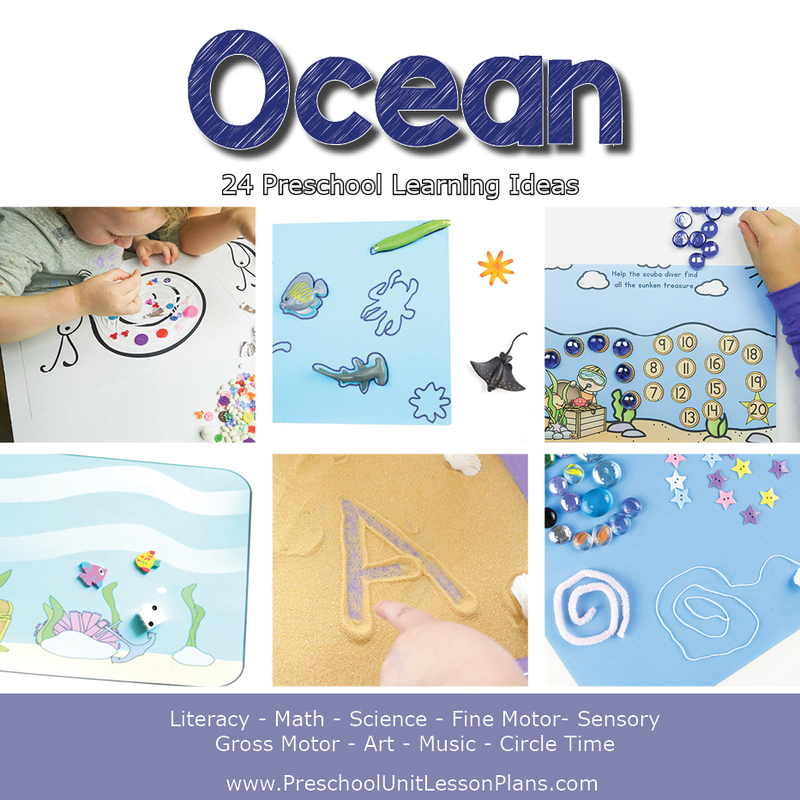 Play some fun ocean games, or if you need more ocean ideas, we have a sea of ideas in this ocean lesson plan in our store. Olympics Theme – The Olympics is fun because it only comes around every few years. Teaching kids about strength and determination can easily be done with an Olympics theme. It can also be fun to do a variety of sports activities! Opposites Theme – Opposites are all around us. Happy and sad, high and low, hot and cold, loud and quiet. This preschool theme can bring lots of fun and learning! Outer Space Theme – There are so many ways outer space can be a ‘blast’. Stars, moons, and planets are just some of the miraculous things you can teach kids about space. Make a night sky sensory bin for some themed sensory play! You can incorporate math by using these space-themed number writing practice cards, making a rocket ship out of a cardboard box, or doing constellation activities. If you’re in need of an entire space lesson plan, we’ve got you covered in our store. Owls Theme – Whoo! Whoo! You could touch on the basics of a bird’s life or use it as a tie-in to a different theme, like desert animals or birds. This is a great time to introduce the classic Owl Moon! Painting Theme – Painting is enjoyed by so many children and adults. There are wonderful artists that could be introduced, or use the painting theme as a fantastic way to explore color and texture. Many process art activities can be incorporated in this preschool theme! Patriotic Theme – Study your country and what makes it unique with this preschool theme. This can include learning about your country flag, national anthem or song, or other important symbols. Penguins Theme – Penguins are such a fun animal! You can learn about where they live, what they eat, how they behave, and winter. Jack Hartmann has an adorable Penguin Song that teaches kids to follow directions through a fun penguin dance! Pets Theme – Kids love their pets, and what a better way to talk about them and their own lives by bringing it in as a preschool theme. A dog and cat preschool theme is also great to have around this time since those are two of the most common pets. 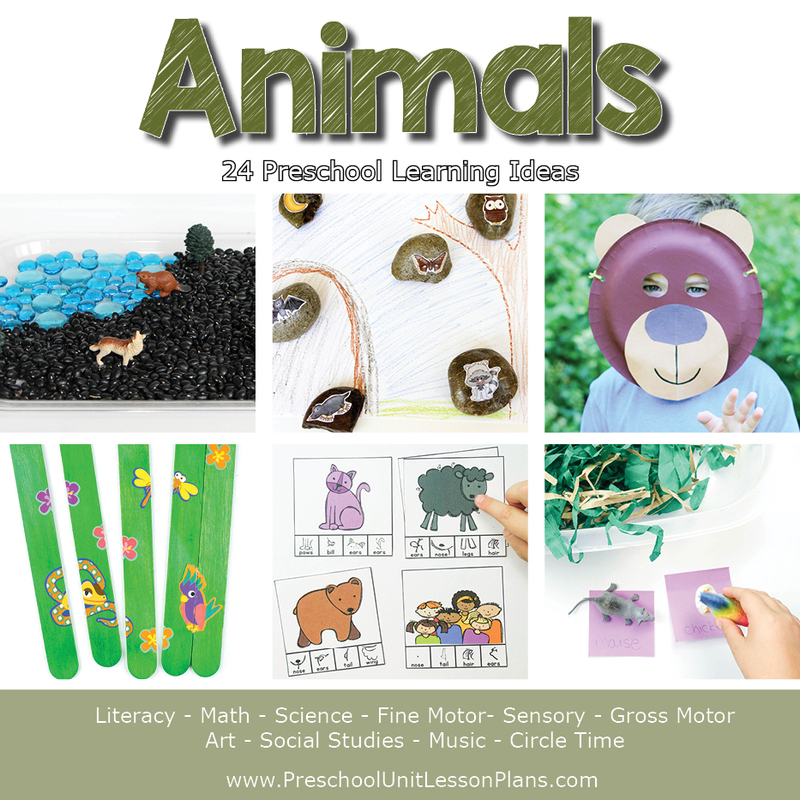 Our friends at Preschool Teacher 101 have a pets lesson plan in their store for planning the perfect pet theme. Picnic Theme – Picnics are universally loved, especially by kids. Eating somewhere new and different is exciting. That same excitement can be spread to learning with a picnic theme. But watch out for the ants while singing The Ants Go Marching! Pirates Theme – Arrrggghhh. A pirate week is a perfect theme for the week of International Talk Like A Pirate Day that happens on September 19th every year! This is a great time to include dress up and pretend play! These pirate lesson plans have tons more great ideas to do with your wee lassies. Plants and Life Cycles Theme – Plants and life cycles are fascinating to kids. Kids will be in awe of how one tiny seed, with the right care, can turn into a full-size plant. I love this theme so much that I incorporated a greenhouse as part of my in-home preschool! Polar Animals Theme – Polar animals are fun, especially when you start talking about how they can survive and stay warm, even when living on snow and ice. This is a perfect theme, even if you live in an area that doesn’t get snow! There are lots of fun science experiments to try with a polar animal theme such as this polar experiment that shows how blubber helps insulate polar animals. Pond Life Theme – Frogs, lily pads, ducks and even insects live in ponds. This is a fun theme to learn about various animals and insects as well as a different body of water. Blue Goose and 5 Little Ducks are awesome felt board stories to use with this preschool theme! Grab an entire pond lesson plan from Preschool Teacher 101. Process Art Theme – Process art is one of my favorites because there are no rules. Kids can be as creative as they’d like and let the art medium take the reins. Check out this colorful CD process art activity! Pumpkins Theme – Fall and Halloween is such a fun season to plan activities around and pumpkins are by far the most exciting. They make a great shape to incorporate different activities as well as actually exploring the pumpkin itself. Enjoy some pumpkin books, pumpkin crafts, and pumpkin art projects to get you started! 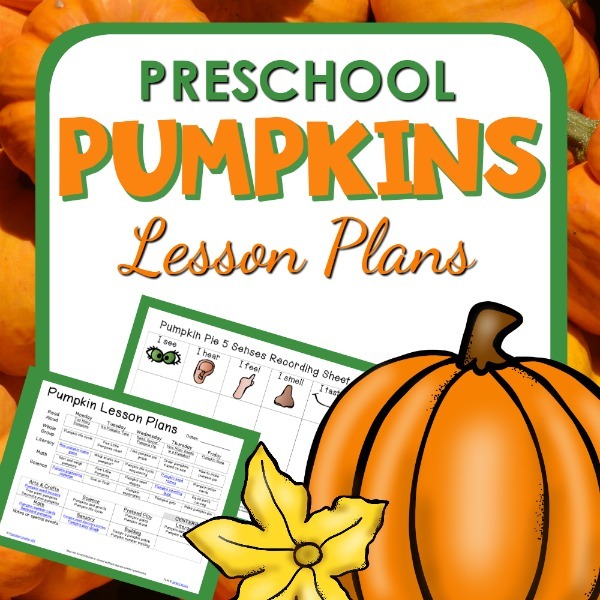 Or get this entire pumpkin lesson plan from Preschool Teacher 101. Queen and King Theme – When you think of King and Queen, do you usually think of fairy tales? I do, and kids will love incorporating the fantasy aspect to learning activities! This preschool theme can tie in easily to your Europe theme or even your bee theme, as you discuss the queen’s role. Quilts and Patchwork Theme – Quilts have a historical aspect to them as well as the idea that multiple small parts create a whole. This is a great theme to help kids learn about community and kindness! Over the years, some of the most thoughtful gifts my kids and I have received are quilts. Rain Theme – Raindrops are essential to springtime and help present a wonderful theme for this season. This is also a useful theme to help discuss and learn about weather or how rain helps the earth grow. Check out this cute and fun rain cloud suncatcher craft! Need an entire rain lesson plan? Preschool Teacher 101 has made this wonderful rain themed lesson plan. Rainforest Theme – A rainforest, just like a jungle, has bold and beautiful colors, greenery and plants as well as super interesting animals! Talk about the unique creatures and intense temperatures. Get an entire rainforest theme lesson plan from our friends at Preschool Teacher 101. Rainbows Theme – We LOVE rainbows and can’t get enough of them! They are the perfect theme to explore color, weather or even fantasy. The supplemental activities are endless –rainbow games, science activities, fine motor practice, sensory play, discovery bottles, process art activities, sight words, crafts, and much more! 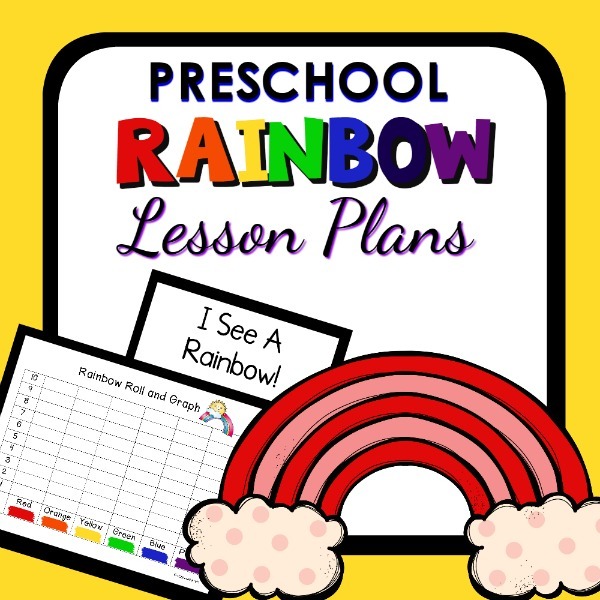 If you need more rainbow lesson plan ideas, you are in luck because Preschool Teacher 101 has them in their store. Recycling Theme – Recycling is important for everyone to learn and implement, but especially for kids. It is not just a different way of putting out the trash, but helping the earth and our home. Reptiles Theme – All animals are interesting, but reptiles are especially fascinating! Turtles are slow-moving, yet lizards are so fast you can barely catch them. This is great for helping to teach motion and speed as well as about the animals themselves. If you’re doing a desert or habitat theme, make sure to include them there too! Rhyming Theme – There are so many ways you can teach rhyming that having a whole week dedicated to this idea is not only fun, but necessary! Rhyming fingerplays can be a great tool to use during this preschool theme. Robots Theme – Robots are the perfect way to help bring STEM into your classroom. Make a robot craft, manipulate nuts and bolts, use robot stickers to count, or build a cardboard robot – there are lots of ways to make a robot theme accessible to preschoolers. We love this recycled robots activity! Or take a peek at this robot theme lesson plan in the Preschool Teacher 101 store. Rocks Theme – Seems like one of my preschoolers always has a pocket full of rocks! They can be so interesting. Talk about how they are naturally created or use them as a math tool, a great canvas for art and rock painting, or blocks for building and creating. Grab a full rock lesson plan from Preschool Teacher 101. Science Fair Theme – Do you remember entering a science fair as a child? Making a baking soda volcano seems like a rite of passage! It is so exciting to not only create a project but share it with your peers. This is a great time to introduce public speaking as well as respect for those who are sharing. For more science fair fun, check out these simple and fun baking soda and vinegar science experiments that use rockets, balloons, and more! Seasons Theme – Seasons are a perfect preschool theme and super fun if you live somewhere with all four seasons. They are something we look forward to, for the change. This is a great theme for teaching kids about weather, plant life, temperature and more! For some supplemental activities, you can consider adding a book or a hands-on craft or art project from each season, winter, spring, summer, and fall. 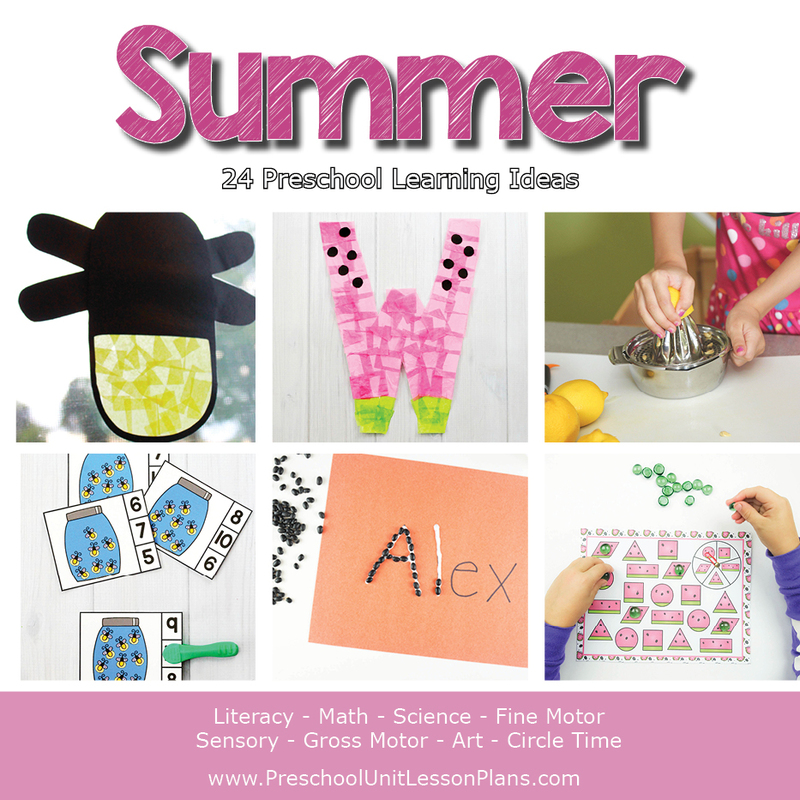 We even have a seasons lesson plan with these activities and more in our store. Seeds Theme – Plants don’t grow without first being a seed. This fascinating process is a great time to help teach kids about life in general, as well as how different beginning and ends can be. Don’t forget to read The Tiny Seed. These seed lesson plans are also full of great ideas. Shapes Theme – Shapes are everywhere! We learn the basics first and branch out to the more geometrical. Not only is it important to learn about shapes themselves, but shapes are the perfect canvas for teaching math, literature, or even science. This preschool theme is a great time to pull those pattern blocks or Korxx blocks out of your block center! Sharks Theme – There’s a whole week dedicated to sharks every year in July or August, which is a great time for a shark theme! What other animal has as many teeth as a shark? Practice counting high digit numbers by counting their teeth. And don’t forget to watch out for the baby shark! Shells – Seashells are so pretty and something that many people like to collect on the beach. This alone is a fun theme but the tie-in options are endless! Get more ideas in this shell lesson plan from our friends at Preschool Teacher 101. Snow Theme – If you live in the right part of the world, you might be lucky enough to get an entire season of snow. It is beautiful and so fun to play in, as well as a great learning tool for science! Need I say more? 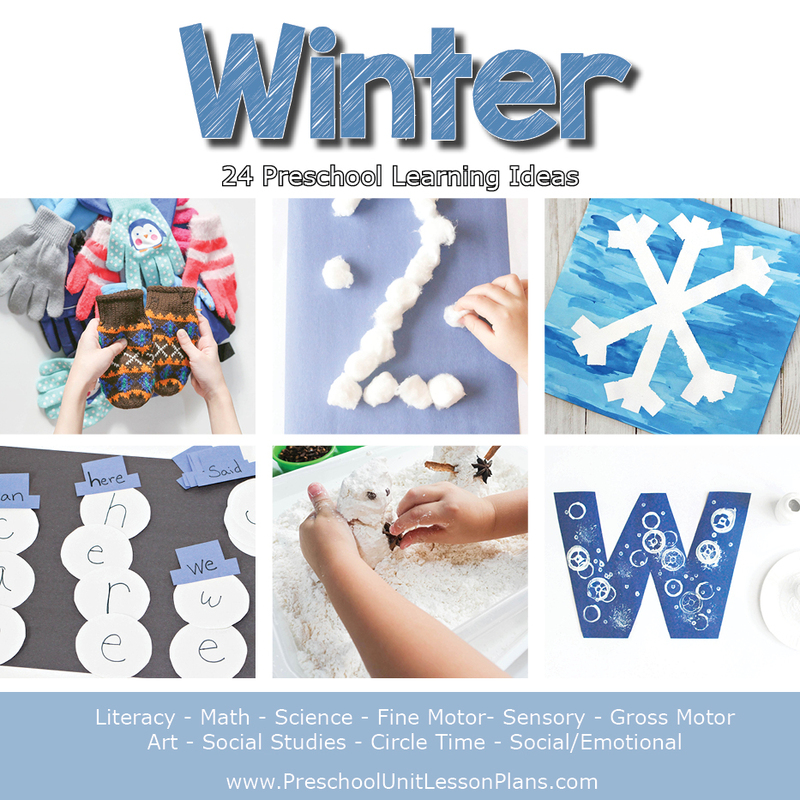 But no matter where you live there are these fun and inviting winter and snow lesson plans. Spiders Theme – Spiders can be creepy, with all their eyes and many legs, but they can also be so cute (see the pet spider craft!). Around Halloween time or with the purpose of exploring insects, spiders make a great theme! Make your own pet spider or throw some spiders in the sensory table for some fun exploration. 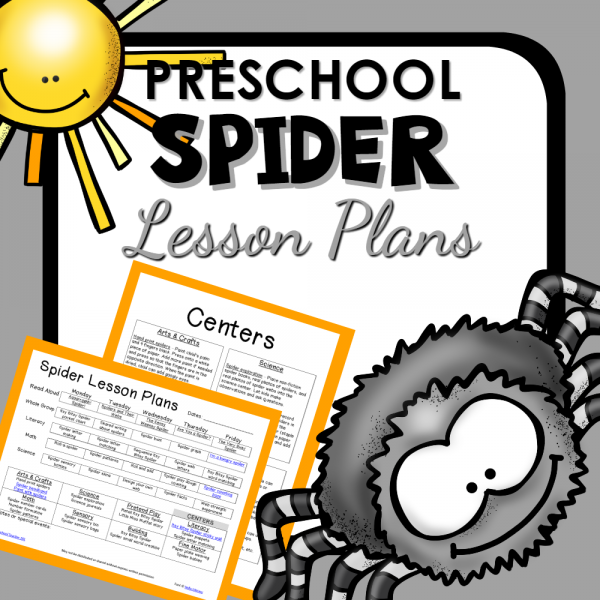 See the fun spider lesson plans from Preschool Teacher 101. Sports Theme – Whether kids play on organized sports teams or use sports as a way to get in physical activity, sports is a fun preschool theme to encourage healthy play! Spring Theme – Spring is so full of life, sunshine, flowers and baby animals. What a great time to make a suncatcher! This theme may need more than one week but it is one you can’t pass up! 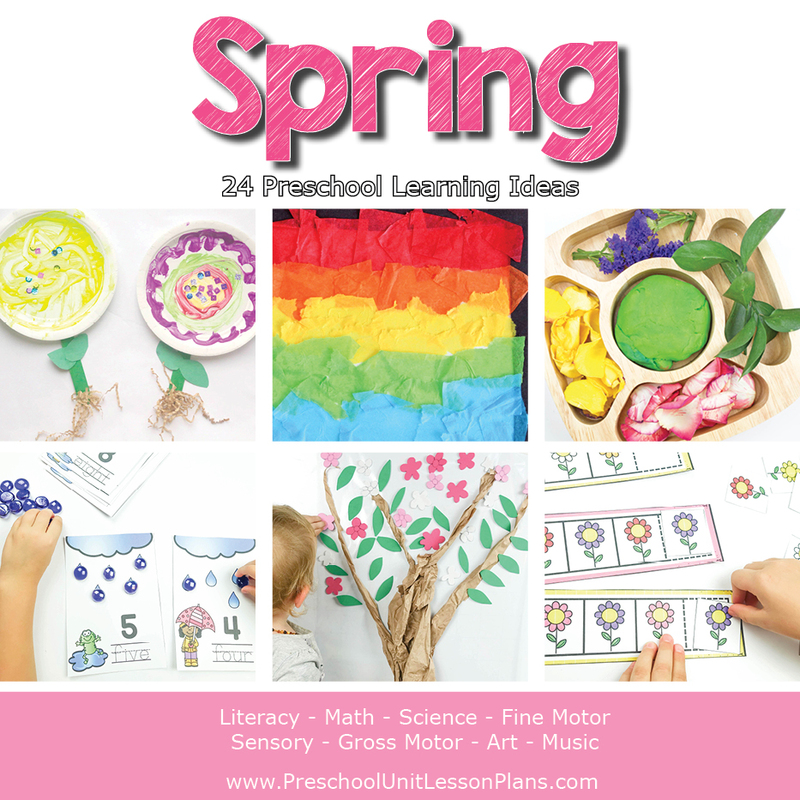 See tons of ideas in our spring lesson plan in our store. St. Patrick’s Day Theme – Having themes surrounding holidays adds in an extra element of fun. This holiday with four-leaf clovers and leprechauns is full of fantasy and magic. Try out this leprechaun slime for some squishy themed sensory play! STEM — Add a bit more science, technology, engineering, and mathematics with an entire STEM theme! We love weeks with STEM activities. 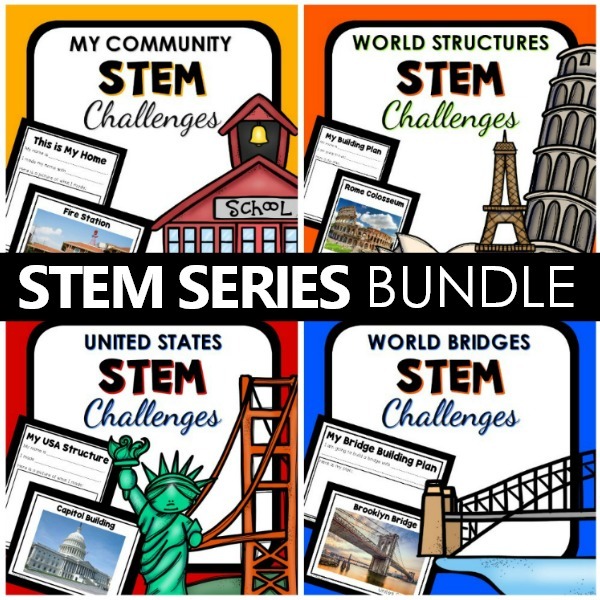 Get lots of great ideas in this STEM Challenges Bundle from Preschool Teacher 101. Squirrels Theme – Squirrels are super cute with their fluffy tails, and they run super fast. This theme is perfect to include with an animal theme, fall theme with a counting activity, or even physical activity! Summer Theme – Summer is full of fun. Pools, beaches, vacations, and of course lemonade. Check out this pool noodle name recognition activity! This is a great theme for the end of the traditional school year or during the summer months. You can see our summer theme in our store. Tea Party Theme – Having a tea party theme is sweet and adorable but is also a super wonderful time to help talk about manners! Teddy Bears Theme – Most kids have their favorite teddy bear that they cherish. These cuddly friends can help motivate children to learn something that they may otherwise have issues with. This preschool theme is a great time to sing the rhyming Teddy Bear, Teddy Bear song or have a Teddy Bear Picnic. Thanksgiving Theme – Thanksgiving is a holiday full of history. This is a great time to touch on historical facts, or help teach children about thankfulness and sharing. There are lots of awesome books about gratitude and thankfulness to use during this theme. 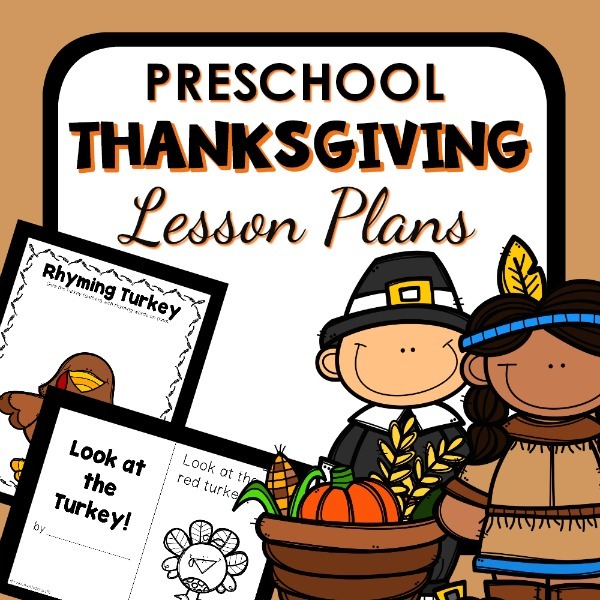 See the Thanksgiving lesson plans for our friends at Preschool Teacher 101. Time Theme – Time clicks by each moment. Learning the concept of time as a child is important and can be fun! This can tie into calendar time with lots of creative activities. Tools Theme – Tools is a great theme because it allows kids to feel more grown up, explore the world that adults live in, and even tap into community helpers and jobs. Tie this one into your construction team for a sure win. Trains Theme – Thanks to Thomas and his train friends, trains can be a super engaging preschool theme! They are colorful, strong and travel across countries. This is a fun way to talk about different states, counting, or even touch on STEM. Transportation Theme – There are many forms of transportation and all help you get to where you need to go! This theme is a fun time to incorporate sensory play by making a bin with all the different modes of transportation. 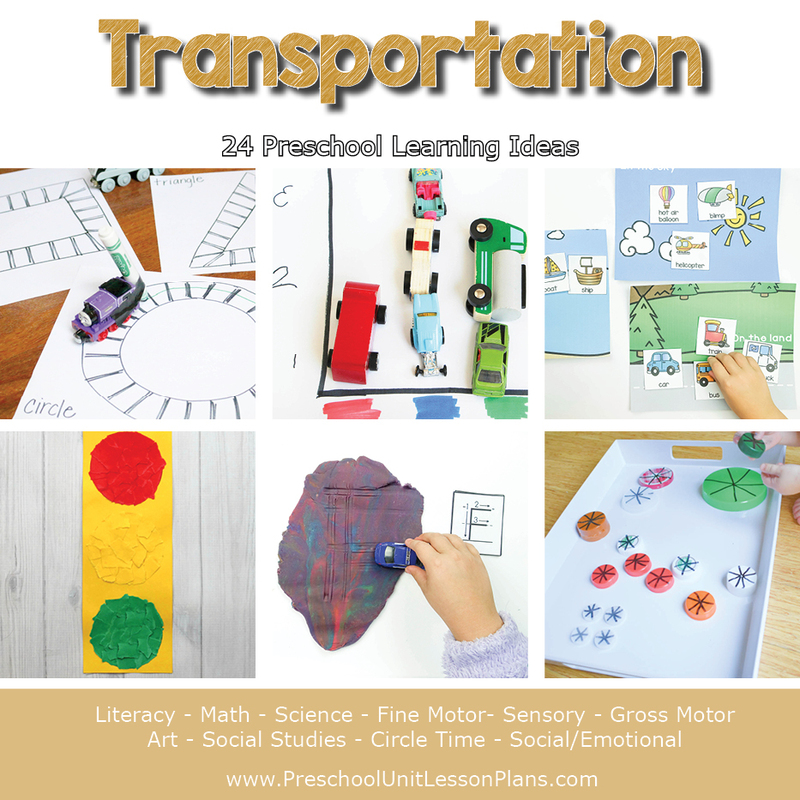 Play some fun transportation games, or get an entire transportation lesson plan in our store. 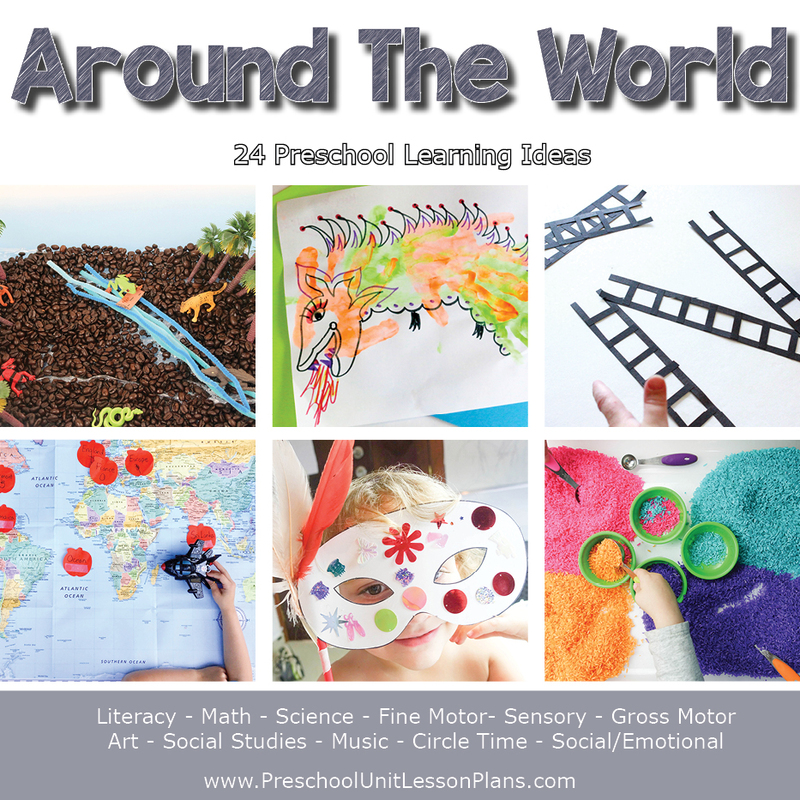 Travel Theme – This is another great preschool theme to get kids talking about themselves! Use a map and talk about all the different places the kids have traveled. Incorporate geography and your transportation theme too. Trees Theme – Trees are beautiful, provide shade and create many things all around us in our home. This theme can also help you teach about air and the environment. Our favorite teacher friends at Preschool Teacher 101 have even made these tree theme lesson plans. Unicorn Theme – Unicorns are a must right now! This is a fantastic theme for introducing another round of fantasy and pretend play. Unicorns were a priority when it came time to hang alphabet wall cards and alphabet posters! Under the Sea Theme – Nemo is not the only interesting thing under the sea, there is basically a whole new world under there! Explore sea plants, animals, shipwrecks, and other fascinating finds under the sea. Valentine’s Day Theme – A fun holiday theme that helps promote love, kindness, sharing, giving and friendship. Plus, this is a wonderful theme for making gifts that parents or other caring adults will cherish. Check out these Valentine’s Day games, crafts, number recognition activities, sensory bin play, and other Valentine’s Day activities like science experiments! Veterinarian Theme – Caring for animals is an important job. With some easy setup, you can learn about the medical world by having kids bring in a favorite stuffed animal for a checkup! This is such a fun preschool theme! Volcano Theme – Volcanos are fascinating and scary all at the same time. This is a great time to teach about different lands and countries, but it is also a classic science experiment that can be explored easily. Did you know that you can make a homemade volcano that can change colors? Weather Theme – Weather is so interesting and there are so many aspects! Consider theming each day around a different type of weather – sunshine, rain, snow, etc. 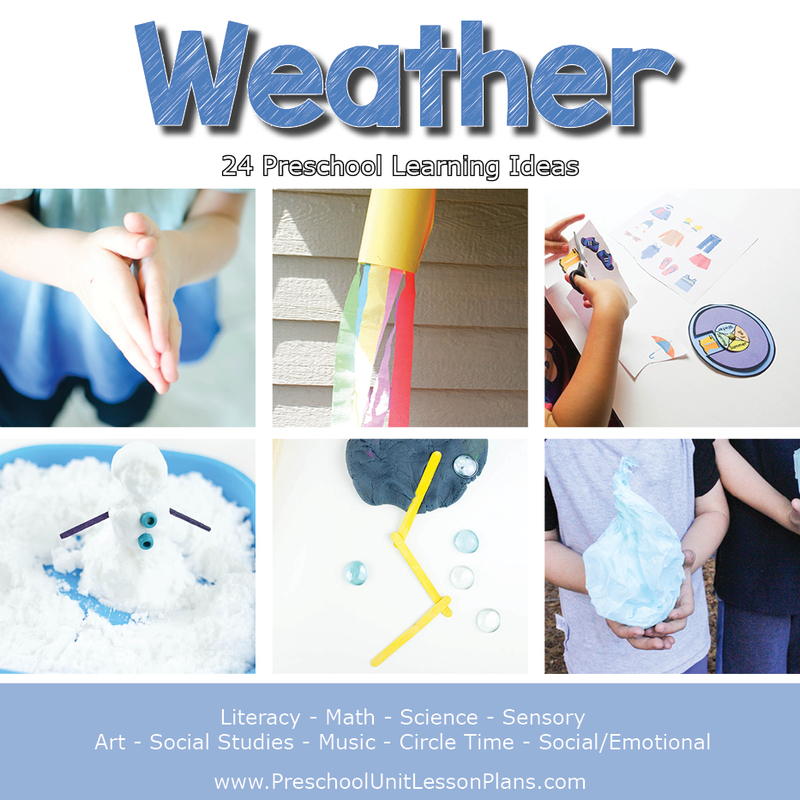 Get more weather ideas in our weather lesson plan in our store. Winter Theme – Winter is full of excitement with snow, artic animals, fun holidays and winter sports. There are so many different ways this preschool theme could go, but all are going to help your students learn! Supplement your theme with these wonderful winter books for children, and take the kids outside for some winter nature observation. 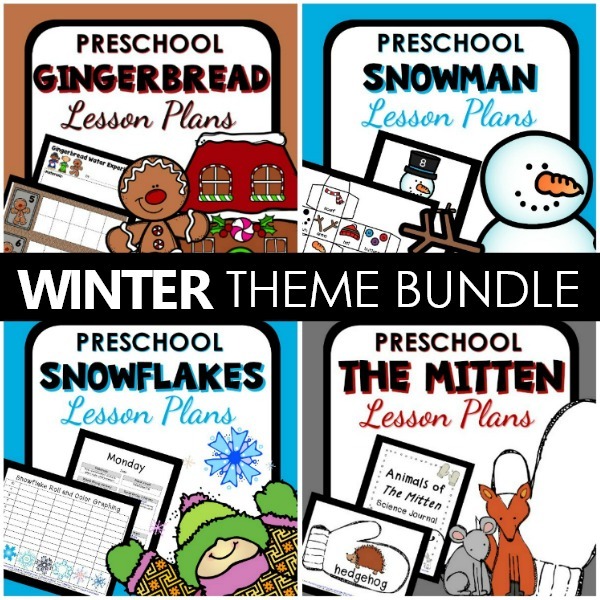 Or see the winter lesson plans in our store. Worms Theme – Worms are more than just slimy creatures that come out after it rains. They also help with soil conditions, are food for other animals, and more! Some of our favorite teachers have put together a full worm lesson plan over at Preschool Teacher 101. Zoo Animals Theme – Going to the zoo is a trip that most kids would never turn down! There are many great children’s books that you can add to this theme and a ton of activities that can help teach a variety of different topics. Get an entire zoo lesson plan from our friends at Preschool Teacher 101. Whew! You’ve made it! And now I hope you have some great inspiration for your next preschool theme. Enjoy! 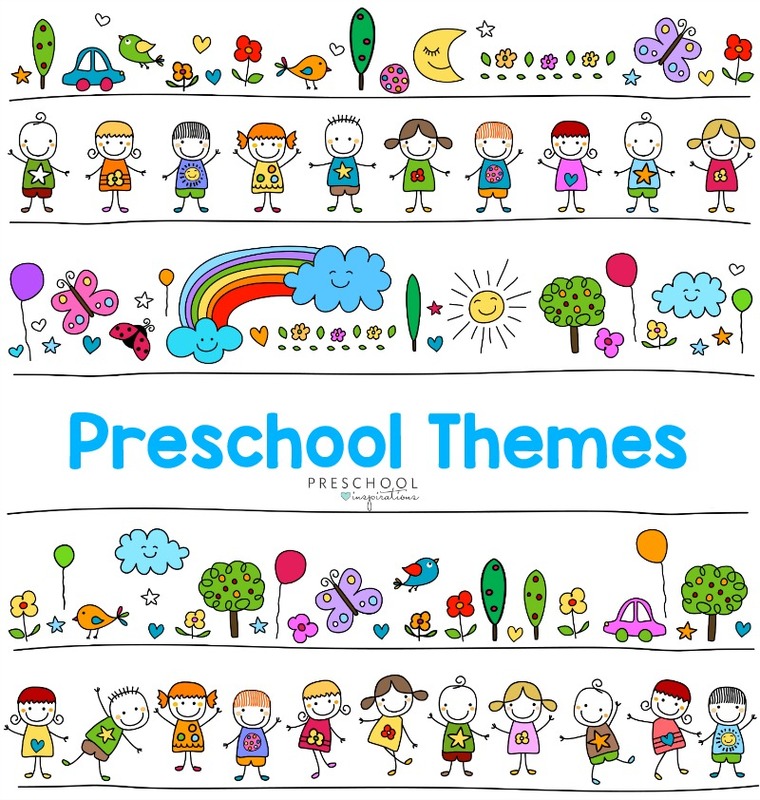 Do you have a printable list of the preschool themes without the pictures and graphics? Thank you. It’s like you read my mind! I’m working on one now and will upload it by next week :).